Several National Parks, Reserves and State Forests are close by. Within an hours drive you can find Nightcap National Park, Mount Jerusalem National Park, Whian Whian State Forest and the Mt Warning National Park. Visit the subtropical rainforests and go for bushwalks at Minyon Falls, the Protester Falls, or climb Mount Warning and enjoy the stunning views of our beautiful Hinterland and beyond. When you have explored Byron Bay and want something different, visit the hinterland. Not far from Byron Bay you can find several other interesting places. Mullumbimby, Bangalow, Nimbin, Billinudgel, Federal to name a few. Several small roads and laneways lead from one to the other and the drive alone can be a wonderful experience. Every Sunday and some Saturdays the local markets are on. 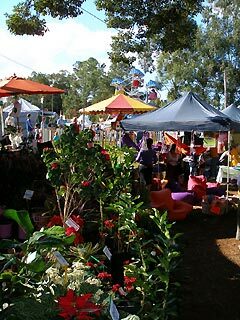 If they are not in Byron itself there is a market in one of the hinterland villages. These trips generally make for a great drive and some interesting shopping for local crafts and produce. For an up-to-date calendar of all markets in the area with links to maps to find them all check out our Byron Bay events calendar.